A couple weeks ago, Anguel and I hopped on a ferry and rode it over to Vancouver Island for an impromptu weekend trip. The last time we’d visited the island was just over two years ago. Back then, we were on an ambitious mission to hike the 50 mile long West Coast Trail. Due to some overzealous non-refundable travel bookings (thanks Anguel), it was literally 48 hours or bust. Most of the time, I couldn’t tell if the adrenaline was thanks to my fast pace (hah) - or fro the fear that we’d miss our flight the next day. In the end, WE DID IT, despite not being able to walk properly for at least a week afterwards. And if the distance wasn't enough to take my breath away, the scenery definitely did. Everything was so wild and raw. It was Mother Nature at her finest - and we were just along for the ride. This time, instead of water filters and goretex, we packed books and our camera. The plan was to relax. And other than that, we had no plans at all. As we passed over that small sliver of the Pacific Ocean, it was hard not to think about how much our lifestyle has changed over the past two years. Gone are the days where we sought to cram our weekends and vacations to their breaking points. Now, we sleep in a bit more. We leave ourselves more time to just chill. And if we did the West Coast Trail again - well, next time, we’d probably set aside at least 4 days. You’ve gotta stop and smell the roses, ya know?! Our dear family friend hosted us at his dreamy beachside home for the night. And he also kindly offered up his fruit trees. We plucked pounds of plums and apples. To say I was in heaven would be an understatement. We ate the plums almost as quickly as we picked them. But the apples? You can bet I stuffed my backpack full with them. And borrowed an extra bag. Those babies were coming home with me. Homemade cinnamon buns definitely don’t carry the reputation of being “instant”. Nor should they. Sometimes the best stuff takes time. In the spirit of enjoying a cozy weekend in, I mixed up a batch of soft and slightly sweet dough - and then rolled up plenty of cinnamon coated apples inside. As if that wasn’t enough, I poured the most luscious vegan caramel sauce over the entire thing. And baked it until the caramel was warm and bubbling. Oh em gee. To me, the holy grail is when you can make sinful desserts a bit more wholesome. Because we all know we’re reaching for that second bun when nobody’s looking. With that goal in mind, I made a few healthy swaps in this recipe - without compromising taste (of course). I usually use spelt flour at home. But sometimes you just need to mimic the effect of white flour, especially in baked goods. Spelt flour, I love you, but not today. Instead, whole wheat flour does the trick. It makes for a lighter, fluffier end result - and it's still a lot more wholesome than white. A combination of coconut sugar and brown rice syrup gives these buns the perfect amount of sweetness - without the toothache. Coconut sugar replaces brown sugar (news flash: did you know that most ‘brown sugar’ is actually white processed sugar that’s had some molasses mixed back in?). And brown rice syrup imparts an almost buttery taste to the rolls, without adding too much sweetness. The results are crazy good. Place yeast and flour into a large bowl. In a saucepan, warm almond milk, coconut sugar, coconut oil and salt over low heat. As soon as the coconut oil is melted, remove from heat. Wait until the liquid cools to to the temperature of lukewarm bathwater (100–110˚F / 38–43˚C), then add it to the flour mixture. Stir until well incorporated. Knead dough for 3-5 minutes until elastic and smooth. Lightly grease the bowl with coconut oil and let the dough rest (covered) for ~1-1 1/2 hours until it’s doubled in size. Meanwhile prepare the vegan caramel. In a saucepan, bring almond milk, brown rice syrup, coconut sugar and lemon juice to a rolling boil. Maintain the gentle boil for 20 minutes, stirring occasionally to scrape down the sides. After 20 minutes the mixture should have thickened slightly. Stir in vanilla extract and salt, and mix well. Transfer to a container and place in the fridge to cool and thicken further. 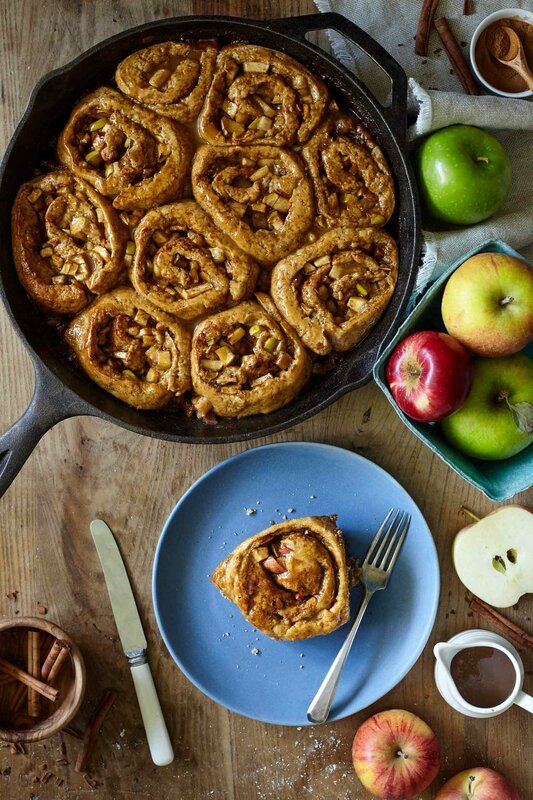 To make the apple filling, heat a frying pan over medium-high heat. Melt coconut oil then add chopped apples, 1 teaspoon cinnamon and 1 tablespoon lemon juice. Saute, stirring regularly, for 3-5 minutes until apples are slightly softened. Remove from heat and set aside. Once the dough has risen, use a lightly floured surface and roll dough into a 15 x 9” rectangle. Spread brown rice syrup, coconut sugar and remaining 1 teaspoon cinnamon on the dough. Set aside 1 cup of cooked apples for the topping; and sprinkle the remainder on top of the dough. Starting on the long side, tightly roll your dough into a log. Slice into 10 even pieces. Place pieces into a heavy skillet pan. Top with 1 cup reserved apples, then cover with a clean towel and let rise for 30-40 mins, while the oven preheats to 375˚F. Cook for ~30 minutes or until golden brown. Remove from oven, pour caramel on top, then bake for another 2 minutes until caramel is bubbling. Store extras in a sealed container or covered tightly with plastic wrap. To encourage the dough to rise, place it in the warmest part of your house. *You can use whatever types of apples you’d like. I leave the skin on, but you can peel them if you prefer.